I just wanted to let everyone know about the new RepRap Magazine, it's from the community for the community and is intended to help everyone. From the curious user looking at 3D printing to experts in self replicating systems and all in between. And discussions about the magazine should be directed here on the RepRap Forum. 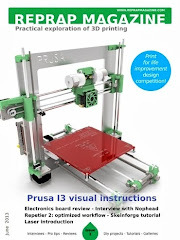 And if you prefer the RepRap magazine also has a page on Google+ is here, for discussions and information. Go and read the first issue now, it's got some great information and background to the RepRap project. And please do get involved with content for future issues, details are in the magazine or e-mail me. And on a slightly longer timescale I'm also planning a comparison review of different RepRap hot-ends, so same again, if you have something to add to this, get in touch. It's one area that's booming with lots of new designs and tried and tested products being revised for printing new materials.